A clear sky. Low 61F. Winds NE at 5 to 10 mph..
A clear sky. Low 61F. Winds NE at 5 to 10 mph. Englewood Elementary School student Mason Long, 11, shows his “Big Brother” Jeff Barnhard the tiny fish caught during the Englewood Fishing Annual Tournament Saturday at Chadwick Park. Dominic Sharrett, 12, a L.A. Ainger Middle School student, celebrated his birthday fishing. His “Big Sister” Dorothy Ott has visited him in school each week for the last year and a half. She baked him cupcakes which he shared with the group. James Ceglarek, 12, fishes with his brother, Jacob, 7, and sister Lola, 10. All of the children are Englewood Elementary School students. Englewood Elementary School student Jacob Ceglarek, 7, casts his rod. Teresa Mason sits with her daughter Heather, 8, during the fishing tournament. Heather’s “Big Sister” Debra Boone wasn’t able to make it. But the pair paints, swims, talks and goes out for ice cream on a regular basis. Izabella Lyons shows off her certificate for participating in the annual fishing tournament. Natalie Anderson, the Mentor Manager for Big Brothers Big Sisters, applauds members of the Englewood Fishing Club who for 10 years helped sponsor the fishing tournament. Longtime Englewood Fishing Club member Bob Nordstrom, who coordinated the event gives a tumber to volunteer Gale Daoust, a 14-year member. Jonathan Reddish is a “Big Brother” to Anthony Jimenez, 11. They fished together Saturday. Ed Pesso, a “Big Brother” for 10 years, now spends time with Christian Grasland, 10. They go to baseball games and make each other laugh. ENGLEWOOD — It’s the little things that Dorothy Ott does for Dominic Sharrett that makes him know he’s important to her. Dominic turned 12 on Saturday. He had already planned on going to the 10th annual Englewood Fishing Tournament with Ott. What he didn’t know is she baked him cupcakes with vanilla icing and different-colored jelly beans on them. Unlike some tweens, Dominic isn’t paired with a “Big Brother” through the school-based Big Brothers Big Sisters program. For the past year and a half, Ott visited Dominic at L.A. Ainger Middle School. Somethings Ott really enjoys about Dominic is like her, he likes to play cards. 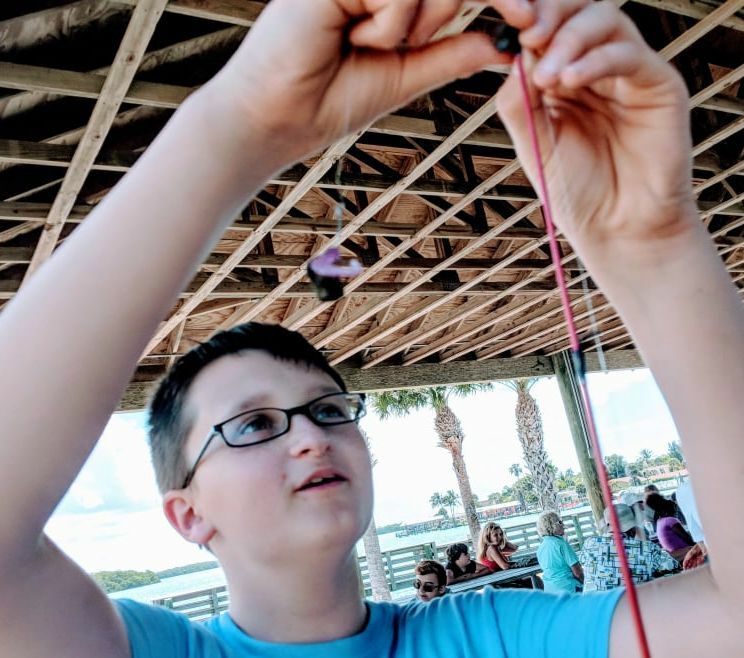 On Saturday, the pair fished at Chadwich Park in Manasota Key along with about 35 other pairs of “Bigs” and “Littles.” After the crowd sang “Happy Birthday” to Dominic, he shared his cupcakes with the crowd. “I haven’t smiled like this in a long time,” he said. While Dominic and Ott have a special bond, another L.A. Ainger Middle Schooler 11-year-old Katelyn Mason is on a wait list to one day have a “Big” in her life. Heather said she can’t wait to be matched with someone who enjoys spending time with her. Heather, Katelyn and their mom, Teresa, fished together at the event. “I almost caught three crabs and two fish, but they jumped and escaped from my fishing pole,” said 8-year-old Heather, a Myakka River Elementary School student. Ed Pesso spent the morning with his “Little” Christian Grasland, 10. Pesso has mentored several “Littles” in the past 10 years. 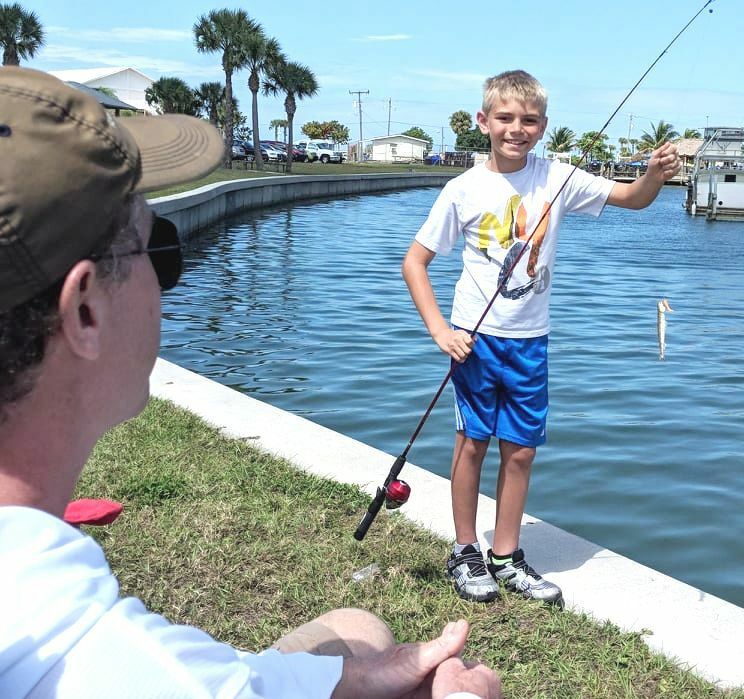 For 10 years, Big Brothers Big Sisters teamed up with the Englewood Fishing Club to sponsor the tournament. The club members organize, cook lunch and help during the event. Then they give each “Little” a certificate for spending the morning fishing with Big Brothers Big Sisters. Big Brothers Big Sisters honored Englewood Fishing Club board members Barry and Kathy Kean for all their hard work and dedication. “Littles” were given awards for the biggest fish, most fish and smallest fish caught. For more information about Big Brothers Big Sisters in Englewood, call 941-473-4003.